Having spent over a decade working in the industry, Edward Ihre has held a number of notable positions. 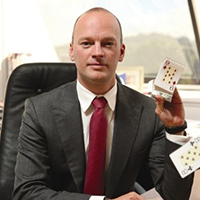 From 2002-2004 he was managing director of operator Parbet UK before moving on to spend two years as director of partnerships and affiliations with operators Ongame/PokerRoom.com, where he lead the redesign and restructuring of the firm's affiliate programme. After that he moved into the same role with operator PokerStars, where he stayed from 2006-2007, before working as managing director of Ladbrokes Poker between 2007 and 2009. In 2010 Ihre founded consultancy firm Ihre Consulting which specialises in the affiliate recruitment and management sector, where he has served as CEO ever since.